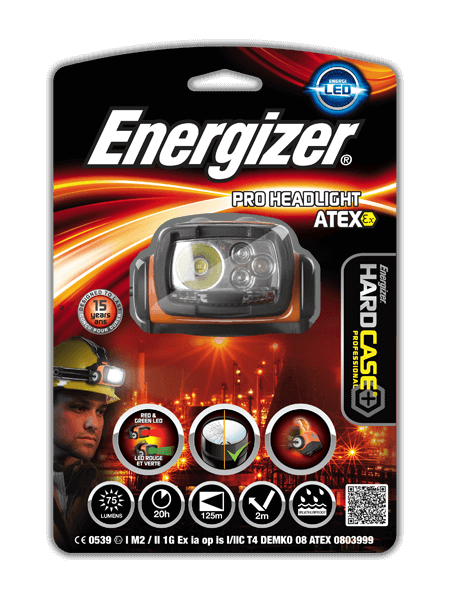 Approved by global safety agencies, the Energizer® Intrinsically Safe Headlight is ideal for work in harsh conditions. Designed specifically for the needs of Industrial trades, this headlight is water resistant, dustproof and survives a drop after drop. It is built to take withstand tough conditions on the jobsite and provides a dependable hands-free lighting solution. Four lighting modes are controlled by two easy-to-operate push button switches. The light pivots smoothly to direct the beam just where it is needed. The adjustable head band secures tightly to safety equipment, while an advanced-grip coating ensures it holds firm under extreme conditions.